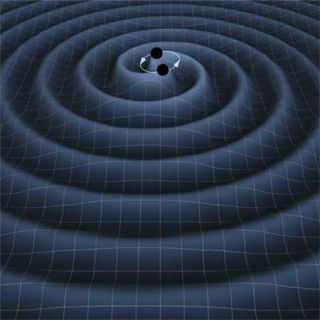 Artist's impression of gravitational waves from two orbiting black holes. Because black holes are impossible to see, one of scientists' best hopes to study them is to look for the ripples in space-time, called gravitational waves, that they are thought to create. Gravitational waves would be distortions propagating through space and time caused by violent events such as the collision of two black holes. They were first predicted by Einstein's general theory of relativity; however, scientists have yet to find one. That could change when the latest version of a gravitational wave-hunting facility gets up and running. The Laser Interferometer Gravitational Wave Observatory (LIGO) is actually a pair of observatories, in Louisiana and Washington state, that began operating in 2002. Newly sensitized detectors are being added to both. Each LIGO facility involves two perpendicular arms in a giant L-shape, stretching out about 2.5 miles (4 kilometers) each. Each arm contains a mirror at either end, with a beam of laser light continuously bouncing back and forth. If a gravitational wave were to pass through Earth, it would create a minute distortion in space-time, changing the distance between the two mirrors in one or both directions, depending on how the wave was oriented. Scientists would measure this as a small difference in the time it takes the laser beams to travel the length of one arm compared with another. Thorne predicted LIGO's first discovery will come between 2014 and 2017. "It depends on how kind nature is and how rapid the commissioning, or the debugging, of the detectors is," Thorne told SPACE.com. "These are very, very complex instruments. It requires a lot of careful work by superb experimenters to bring them up to their design sensitivity." If LIGO does succeed in finding gravitational waves, the ramifications could be far-reaching. Not only would such a discovery confirm that these traveling warps exist in space-time, it would provide precious information about the nature of the black holes or other objects that created them. By studying the shape of the gravitational waves – their "waveforms" – scientists could extract information about the objects that formed them. A gravitational wave produced by a collision of two black holes, for example, would have a particular waveform, according to theoretical simulations. "We will be able, for each black hole pair, to say what the masses of those black holes were, what their spins were, what the orbit was like, as well as where these objects are in the universe — where they are in the sky and how far away they are," Thorne said. "So there's a great deal of information in those waveforms both about relativity's predictions of warped space-time and about what's going on in the universe with black holes."